Hand pain is caused by a number of different conditions, but Raynaud's disease pain tends to be extremely debilitating. The iGlove Hand Pain-Relieving Electrode Gloves are created to offer fast and effective pain relief to improve mobility and reduce swelling. These gloves are specifically designed for use with a TENS machine, and are particularly effective with the Sports TENS 2 Muscle Stimulator Machine. How Do the iGlove Pain-Relieving Electrode Gloves Work? 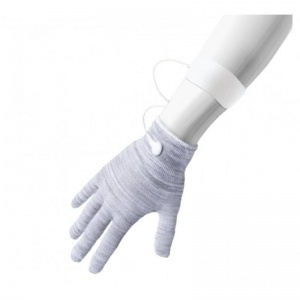 The iGlove Hand Pain-Relieving Gloves are designed to plug into a TENS machine to offer targeted stimulating therapy. Simply dampen the gloves with a little water prior to use and the gloves will do the rest! Using a newly developed 'Silver Stim' conductive fabric that works best when damp, the gloves allow the stimulation from the TENS unit to pass through the hand and improve blood flow and mobility while also relieving discomfort. Ensure that the stimulator is turned off. Insert one pin connector (from one lead pair) into the connector attached to the glove, and the other (from the same lead pair) into the connector on the electrode pad. The gloves should be worn slightly damp to improve current flow. Place the electrode pad on the same limb as the iGlove. If necessary, hand wash the iGloves and dry flat at room temperature.